Cholesterol levels are an important health marker. When cholesterol is excessively high it can lead to a wide range of coronary diseases. One study conducted on men between the ages of 40 and 84 also concluded that cholesterol levels, especially the ratio between total cholesterol and the so called “good” high density lipoprotein (HDL) cholesterol, can negatively impact blood pressure. Hypertension, the study found, was more common in the men who did not treat cholesterol. After 14 years 1,019 men out of the 3,110 in the study now had high blood pressure after not being treated for high cholesterol and with no prior history of blood pressure problems. The men in the study were evaluated and factors that can affect blood pressure were weighted before determining that those men with high total cholesterol levels were 23 percent more likely to develop hypertension. When factoring in the ratio between total cholesterol and HDL cholesterol, those with the highest ratio were determined to be at a 54 percent higher risk than the men with cholesterol levels at the lowest end of the reported range. Different studies evaluating the same hypothesis in women found that high cholesterol was linked to the development of high blood pressure in women. Dr. Howard D. Sesso and others led this particular study from Harvard Medical School. Many of the dietary changes used to control cholesterol are also important in managing blood pressure. To reduce the risk of hypertension, cholesterol should be controlled as well. A low-fat, low cholesterol diet can help with both. Exercise in conjunction with diet, can raise HDL levels and improve ratios. 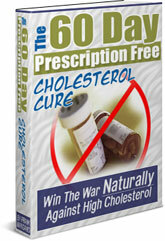 A plan outlining how to implement both diet and exercise to reduce cholesterol can be found in The 60-Day Prescription Free Cholesterol Cure.